The 10 Best Mobile Tax Apps to Use This Season | SuperMoney! With tax season right around the corner, the tax man will soon be knocking at your door. Though filing your taxes and keeping track of them is probably not your favorite task, new apps on the market are making the often dreaded chore a little easier. Many of these handy mobile apps for taxes are also free. Developed by the IRS, this free app enables you to connect with the IRS whenever and wherever you are. You can check on the status of your refund (the fun part!) and use the app to sign up to receive IRS Twitter feeds and helpful, potentially money-saving tax tips. TaxACT has apps that when used together make the process of filing your tax returns a breeze. TaxACT Express allows you to easily and at no cost file your federal taxes from your smartphone. You can complete the entire return on your phone or start the return on TaxACT.com and finish on the go. TaxACT Central is a companion to Express. This app contains a tax return calendar and checklist that allows you to get organized and ready to file your returns. It also contains a help center and allows you to check the status of your e-filed returns and your federal refund. DocVault is another companion app that you can use throughout the year to make filing a breeze. The app allows you to organize and save your necessary tax information and documents throughout the year. You can securely save photos of tax forms, banking records, receipts, invoices and charitable donation statements. Worried about owing a lot of money or curious how big of a refund you’ll be getting? TaxSlayer is a free app that allows you to use your paycheck or W-2 to estimate your 2013 tax refund. That way you’ll know if you need to celebrate or start saving. This app gives you access to tax rates and schedules from now back to 2011. Discover key information such as standard mileage rates, individual tax rate schedules, income tax rates for estates, capital gains and dividends taxed as net capital gain, retirement plan limits, and more. The app allows you to quickly change the year of reference. This app helps you complete U.S. federal and state returns using step-by-step instructions. The app is free to download and allows you to prepare your tax returns and e-file for free. Features include the ability to take a picture of your W-2 with your phone and import it into your return. 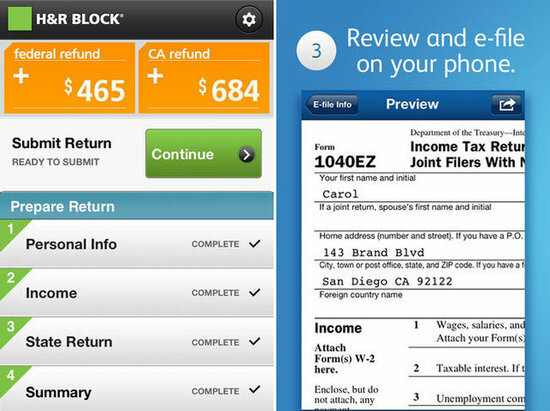 This app allows you to get a quick estimate of your 2013 tax refund. You simply enter some basic information, and you see your refund add up. The program uses the same tax calculator used in TurboTax. Based on your tax situation, the app will recommend the right TurboTax product for your needs. As its name suggests, this app allows you to quickly check on the status of your e-filed federal and state tax returns. It also gives you an immediate estimate of the date you can expect your federal tax refund. It’s not necessary to be a TurboTax customer to use the app. Get answers to your pressing tax questions with this free app, which was created by a CPA. Up-to-date answers found on the app include latest tax changes, itemized deductions rules, tax rates and how to file. With this easy-to-use app, you simply snap a photo of your W-2, answer a few simple questions and e-file from your phone. Filing your federal return is free; there’s a charge for your state return. If you’re filing a 1040EZ form, you can get your return done in as little as 10 minutes. If you want to learn more about taxes in general and what all the lingo means, this app will help you get up to speed. It contains more than 600 tax terms and is fully browseable and searchable. These tax apps unfortunately won’t make filing your taxes unnecessary, but they will help ensure that the process runs more smoothly. *All apps are available on iTunes, though this app may not be available for Android users. Julie Bawden-Davis is a staff writer for SuperMoney. Her mission is to help fight your evil debt blob and get your personal finances in tip top shape. Can a Credit Freeze Protect Me Against Identity Theft?